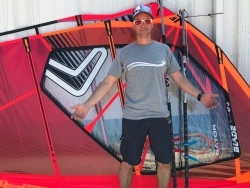 Sportif have been offering windsurfing and kitesurfing clinics, camps and professional coaching weeks for over 25 years as well as Learn to Windsurf and Learn to Kitesurf holidays. 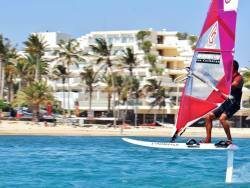 If you are looking to improve your windsurfing or kitesurfing skills and technique, a Sportif holiday offers a choice of individually tailored, flexible packages. A Sportif Clinic, Camp or Professional Coaching Course will help you achieve your goals at a pace to suit you, as part of your holiday. Our locations are chosen for the optimum learning conditions with professional centres on the spot providing the latest equipment, first class service and a comfortable setting for theory and video analysis off the water. For individually focussed tuition, in a fun and sociable group of like-minded individuals, choose a Sportif Coaching holiday. With over 30 years experience we offer an unrivalled expertise and the most experienced, professionals and technique experts to help you improve your skills in a short time. 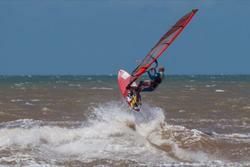 Sportif Windsurfing Clinics and Masterclass weeks are available with leading authorities on Windsurfing coaching. Peter Hart, Jem Hall, Fanatic Pro Rider - Tom Brendt, and RYA Trainer, Starboard and Severn Team Rider Simon Winkley, As Technique Editors for the top UK and worldwide windsurfing press and international authorities and professional coaches, they offer an unrivalled breadth of experience as instructors teaching and coaching for over 25 years. Sportif Kitesurfing Clinics are led by World Class Pro Rider Kirsty Jones, professional kitesurf coach and qualified yoga teacher. Starting the day with stretch routines, these sociable kitesurf camps offer independent kitesurfers specialist tuition with wave technique for those who want it, superb guided downwinders and options of surfing, SUP and excursions. Ideal for solo travellers, these fun weeks, offer the highest standards in kitesurf instruction to ensure your kiting reaches new heights. Sportif offer programme of lessons and rental with a combining kitesurfing, windsurfing, surfing and SUP to suit you. Whatever your level of ability we can provide a combination sports for all levels from beginner to expert. Based at professional centres, using the latest equipment with instructors providing the guidance you are looking for. Additional sports now available in selected resorts include mountain biking, climbing and yoga. For apres surf many of our centres offer welcome cocktail parties and organised excursions. Of if you are looking for a Learn to Windsurf or Learn to Kitesurf a Sportif holiday will offer the perfect combination of specialist sports services in warm water locations.